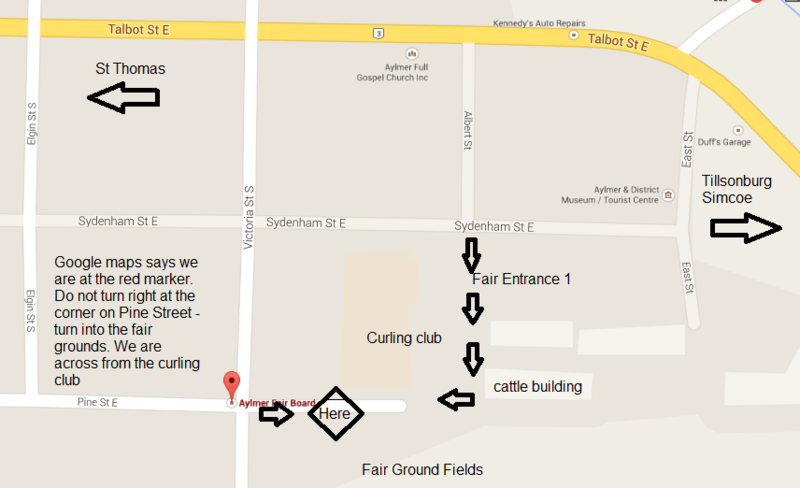 We train at the Aylmer Fair grounds. 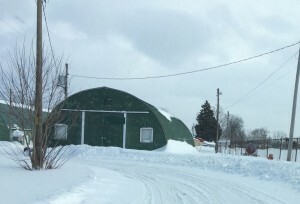 Indoor training utilizes the green Quonset hut just inside the Pine Street entrance. The Quonset is large enough for 1 official sized Obedience/Rally ring. There is a lot of room for individual practice. Outdoor training is in the fields adjacent to the Quonset hut. In this picture we are at the corner of Pine St and Victoria looking Right (East) into the fair grounds. We strive to stay away from any area used by the pony club, especially when horses are on the property. Note – All space outside of the Quonset is community property. We have no ‘first right’ to any area beyond the Quonset. Inside the Quonset is ‘not’ public property but rented, insured and managed by Black Ridge. East street is only 1 block long and dead ends at the Fairgrounds main gates. Follow the parking lot to the left and keep going until you see a green building, on your left. If you enter the Aylmer Fair Grounds into a GPS or Google Maps then they will tell you to go to the middle of Pine street. If you come from 78/Imperial road onto pine street then just keep driving. It will take you right into the fair grounds. The green building will be right in front of you. If you are stuck then call.